Picture is kindly borrowed from Google Inc. for Educational purpose. So what is wrong with this picture? Could it be the strange size of Greenland and Africa? Other has it, that Africa is 30 million km2 and Greenland is 2 million km2. How did it come to look like that on google maps? Africa shold have been 15 times larger than Greenland. It beats my eyes. Who is a conspiracy, Rene Descartes? 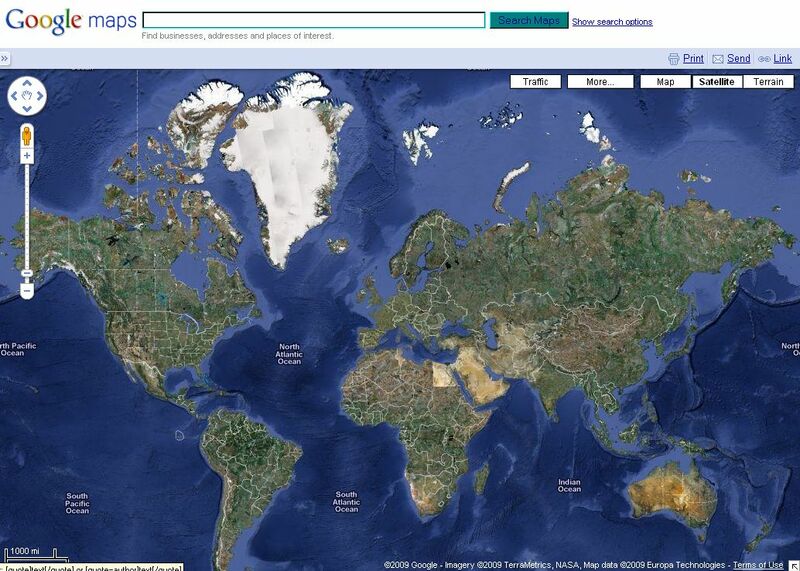 And i just noticed that the downloadable version "Google Earth" actually has the round version of earth and not the flat version as maps.google.com are using. Camera position, i don't think so! They must be using the same data as in Google Earth. 3d sphere on 2d paper? This is a computer animation made to look 2d from 3d, no paper involved, and it's just very poor in quality conversion from "3d" to 2d, why not keep it as a sphere as they had it in their online beta version of Google Earth, now the online version is called Google Maps and it is a flat sketch. It's not just GooGooGooogle. Many maps are funny made, even with the use of satellite "photo". It can also give some hint to how 9/11 event was "filmed". Why use satellite photos in the first place, when they are so bad that the military are not using photos from satellites - Or - Why do they then have the Open Sky Treaty? Photographing other countries from aircraft. Could it be about atmospheric refraction? Grønland er på størrelse med Mexico. Har selv haft et verdenskort hængende på væggen engang, der var samme forhold. Men det er jo fordi de linier der normalt mødes på nord- og sydpolen er glattet ud, sådan så den runde kugle kan blive et kort. Ikke den helt store mystik. Tak for en fed side. Australia is 3½ times bigger than Greeland, so there is more wrong with the picture. When most people are being asked which is the biggest they automatically say Greenland. In high school my exame in geography was about Australia. Concerning Australia all 7 billion people can live there with a house and enough ground to grow their own vegetables, etc., and there will still be some space left - something is very very wrong.